This article focuses primarily on pancreas transplantation. For complete discussion of kidney transplantation, see Pediatric Kidney Transplantation and Renal Transplantation. 1. Pancreas transplant alone (PTA): Indicated for patients with type 1 diabetes who have frequent episodes of hypoglycemia with or without unawareness, impaired quality of life, or other issues with insulin therapy tolerance. These patients have adequate kidney function and kidney transplantation is not indicated. 2. SPK transplant: The organs are from the same donor. The primary use has been in patients with type 1 diabetes who have an estimated glomerular filtration rate (eGFR) of 2</sup> or are on renal replacement therapy. 4. Pancreatic islet cell transplantation: Offers lower morbidity but inferior long-term results compared with solid organ (pancreas) transplantation. In evaluating a patient for SPK transplantation, the quantification of daily insulin requirement and serum fasting C-peptide levels are used to determine the type of diabetes present, the severity of insulin resistance, and the possible benefit of pancreas transplantation. A highly insulin resistant patient will have a high insulin requirement (>1-1.5 units/kg) and a high fasting C-peptide level (>4 ng/mL). These patients might remain insulin dependent despite a pancreas transplant. However, these values must be considered within the overall clinical picture. For example, a patient on peritoneal dialysis with dextrose-containing dialysate will have greater insulin requirements that will decrease once kidney transplantation eliminates the need for dialysis. C-peptide is not an exact marker in patients with chronic kidney disase as it has varying clearance in these patients. In addition, in a patient who is taking insulin, the C-peptide level will be falsely low if the sample is drawn when the patient is hypoglycemic; thus, the C-peptide result must be interpreted in light of a concomitant glucose measurement. Hemoglobin A1C should be measured, to assess the severity of the patient's diabetes. The clinician must be aware of the clinical picture when interpreting these values, as noted above.The use of C-peptide is controversial. The microvascular complications of diabetes are directly related to glucose concentration. Thus, normalizing glucose through successful pancreas transplantation might be expected to stabilize or reverse microvascular complications. The resulting benefits of pancreas and kidney transplantation are discussed below. Most pancreas transplantation candidates have had diabetes for 20-25 years on average prior to consideration for transplantation and consequently, many of them have had laser surgery for retinopathy. This was a common peritransplantation finding in most studies. The severity of these ophthalmologic changes may obviate a clear salutary effect of PTA or SPK transplantation on retinopathy. Significant numbers of pancreas transplantation candidates have advanced renal disease. The most common scenario for pancreas transplantation is in combination with a kidney transplant to treat patients with diabetic uremia. SPK would help to prevent the deleterious effects of diabetes on the new kidney transplant. Coronary artery disease (CAD) is the most important comorbidity to consider in patients with type 1 diabetes and diabetic nephropathy. Patients with diabetes and ESRD are estimated to carry an estimated 50-fold greater risk for cardiovascular events than the general population. The prevalence of significant CAD (>50% stenosis) in patients with diabetes who are starting treatment for ESRD is estimated to be 45-55%. [28, 32] Because of diabetic neuropathy, patients may not experience angina during episodes of myocardial ischemia. Patients with ESRD and diabetes have an increased rate of strokes and transient ischemic attacks. Deaths related to cerebral vascular disease in patients with ESRD are approximately twice as common in those with diabetes as in those without diabetes. Strokes occur more frequently and at a younger age in patients with diabetes than in age- and gender-matched nondiabetic patients. Lower-extremity peripheral vascular disease is significant in patients with diabetes. Patients with ESRD are at risk for amputation of a lower extremity. These problems typically begin with a foot ulcer associated with advanced somatosensory neuropathy. Autonomic neuropathy is prevalent and may manifest as gastropathy, cystopathy, and orthostatic hypotension. The extent of diabetic autonomic neuropathy is often underestimated. Impaired gastric emptying (gastroparesis) is an important consideration because of its significant implications for the posttransplant course. Patients with severe gastroparesis may have difficulty tolerating oral immunosuppressive medications that are essential to prevent rejection of the transplanted organs. Episodes of volume depletion with associated azotemia frequently occur in patients with SPK transplants. Gastrointestinal morbidity is a common indication for readmission following pancreas transplantation. Neurogenic bladder dysfunction is an important consideration in patients undergoing bladder-drained pancreas-alone transplantation or SPK transplantation. Inability to sense bladder fullness and empty the bladder predisposes to high postvoid residuals and the possibility of vesicoureteral reflux. This may affect renal allograft function adversely, increase the incidence of bladder infections and pyelonephritis, and predispose to graft pancreatitis. These conditions are common in patients with longstanding diabetes. This may have implications for rehabilitation after transplantation. Peripheral neuropathy is also an indicator for increased risk of injury to the feet and subsequent diabetic foot ulcers. Mental illnesses, including neurosis and depression, are common in the insulin-dependent diabetic population. Diagnosis and appropriate treatment of these illnesses prior to obtaining a pancreas transplantation can significantly enhance medical compliance. The greatest risk of graft loss is within the first year post-transplant and in particular the first 3 months, regardless of type of pancreas transplant. The International Pancreas Transplant Registry data analyses have used independence from insulin as the main criteria for graft survival. The best SPK transplant pancreas graft survival rates have been 86% at one year and 73% at 5 years. SPK outcomes are superior to those with PAK and PTA transplantation. An advantage of SPK transplantation is that acute rejection can be detected more easily, because serum creatinine can be used as a marker. In PAK transplantation, 1-year and 5-year pancreas graft survival rates are 80% and 58%, respectively. For PTA, the comparable rates are 77% and 56%. Criteria for pancreas donor selection include age and body mass index. Donors are typically younger than 55 years of age and the body mass index should be less than 30 kg/m2. The timing of allocation of the pancreas graft to a specific patient relative to the procurement of the organ has important implications. Determining donor human leukocyte antigen (HLA) typing, serologic testing, and immune compatibility testing prior to procurement of the organs is preferred. In addition, the cold ischemia time of the pancreas prior to implantation is minimized. Pancreas allografts do not tolerate cold ischemia as well as kidney allografts. Ideally, the pancreas should be revascularized within 24 hours from the time of cross-clamping at procurement. Technical concerns that must be considered in patients undergoing pancreas transplantation include whether the venous drainage should be placed into the systemic circulation or into the portal venous circulation. Another controversial topic is whether the exocrine secretions should be drained into the small bowel (enteric drainage) or into the bladder. The surgical techniques for pancreas transplantation are diverse, and no standard methodology is used by all programs. The principles are consistent, however, and include providing adequate arterial blood flow to the pancreas and duodenal segment, adequate venous outflow of the pancreas via the portal vein, and management of the pancreatic exocrine secretions. Pancreas graft arterial revascularization typically is accomplished using the recipient's right common or external iliac artery. A Y-graft (procured from a deceased donor's iliac arteries) of the pancreas is anastomosed end-to-side to the pancreas graft's superior mesenteric vein and splenic vein. Positioning of the head of the pancreas graft cephalad or caudad is not relevant with respect to successful arterial revascularization. The kidney is conventionally placed on the recipient's left iliac vessels. Both organs may be transplanted through a midline incision and are placed intraperitoneally. Two choices are available for venous revascularization in pancreas transplantations: systemic and portal. Approximately 15% of pancreas transplantations are performed with portal venous drainage, and the remainder are performed with systemic venous drainage. No clinically relevant differences in glycemic control have been shown with the two approaches. Handling the exocrine drainage of the pancreas is the most challenging aspect of the transplantation procedure. Currently, enteric drainage is used in more than 80% of pancreas transplantations. Enteric drainage of pancreas grafts is physiologic with respect to the delivery of pancreatic exocrine enzymes and bicarbonate into the intestines for reabsorption. Enterically drained pancreas grafts can be constructed with or without a Roux-en-Y enterostomy. The enteric anastomosis can be made side-to-side or end-to-side with the duodenal segment of the pancreas. Intra-abdominal abscess from leakage was an important complication of enteric-drained pancreas grafts, but with current management techniques the risk of intra-abdominal abscesses is extremely low. Bladder drainage of the transplanted pancreas was a modification introduced in the mid-1980s. Although this technique minimizes the occurrence of intra-abdominal abscess, its potential complications include cystitis, urethritis, urethral injury, balanitis, hematuria, metabolic acidosis, and the frequent requirement for enteric conversion. Consequently, enteric drainage has effectively replaced bladder drainage in most centers. Other medications are rarely used in current practice. Cyclosporine and azathioprine have been replaced by tacrolimus and mycophenolate, respectively. Limited data exist on the use of mechanistic target of rapamycin (mTOR) inhibitors (eg, sirolimus, everolimus). For further discussion, see the Medication section of Renal Transplantation. Surveillance for dysfunction in the transplanted organ is the critical purpose of graft monitoring. Rejection is always a possible diagnosis but in pancreas transplantation other possible etiologies of dysfunction must be considered, including graft thrombosis and pancreatitis (these are further discussed in Complications of Transplantation, below). Adherence to the immunosuppressive regimen should be confirmed. Obviously, if the patient is failing to take the medications as prescribed, that should raise concern for rejection, depending on the clinical picture. If the serum amylase and lipase rise, the usual next step is imaging of the pancreas, including visualization of pancreatic blood flow (with CT scan or Doppler ultrasound) to evaluate for bleeding, mass effect, or loss of blood flow. If no significant findings are noted, check donor-specific antibodies and consider ultrasound-guided biopsy of the pancreas transplant. Of note, abdominal distension (as in constipation) can cause elevations of amylase and lipase as well; another important differential diagnosis is native pancreatitis. In patients with type 1 diabetes, rising autoantibody levels—specifically, anti-glutamic acid decarboxylase—in the setting of hyperglycemia suggest pancreas transplant dysfunction due to an autoimmune process. Perform a pancreas transplant biopsy if there is high suspicion of rejection. If this procedure is technically difficult, consider a kidney transplant biopsy even if transplant kidney function is unchanged. When rejection or significant dysfunction is found it is prudent to contact the transplant center responsible for the patient. Surgical complications are more common after pancreas transplantation than kidney transplantation. Nonimmunologic complications of pancreas transplantation account for graft losses in 5-10% of cases. These occur commonly within 6 months of transplantation and are as important an etiology of pancreas graft loss in simultaneous pancreas-kidney (SPK) transplantation as is acute rejection. Infectious complications are common after SPK transplantation. It is important to note that transplanted patients are usually screened for infections (in particular for BK virus, with kidney transplants) and are placed on prophylaxis for the first 3- 6 months or longer for cytomegalovirus, urinary tract infection, Pneumocystis jiroveci pneumonia, and oral thrush. The following complications should be evaluated for when the patient presents with pain at the graft site and abnormal biochemistries including persistent hyperglycemia and/or elevated amylase or lipase levels. 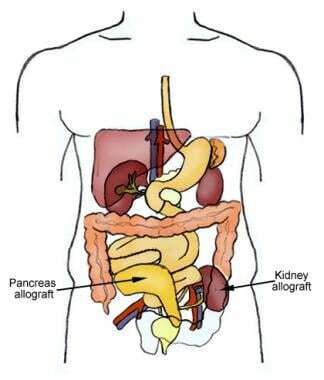 Pancreatitis of the allograft occurs to some degree in all patients postoperatively. Elevation in serum amylase levels for 48-96 hours after transplantation is common. These episodes are transient and mild, without significant clinical consequence. Interestingly, patients undergoing SPK transplantation commonly have a greater degree of fluid retention for several days after transplantation than do recipients of kidney transplantation alone (KTA). Although not proven, this may be related to postoperative graft pancreatitis. The retained fluid is mobilized early postoperatively. 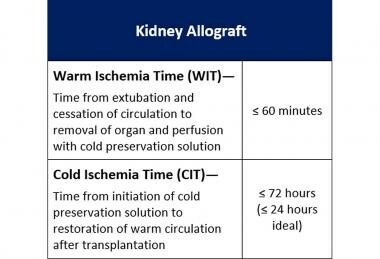 It is important to minimize the risk of delayed kidney-graft function by shortening cold-ischemia time, promoting prompt elimination of the retained third-spaced fluid, and avoiding an episode of heart failure or pulmonary edema. The most serious complication of the enteric-drained pancreas transplantation is leak and intra-abdominal abscess. This problem usually occurs 1-6 months after transplantation. Patients present with fever, abdominal discomfort, and leukocytosis. A high index of suspicion is required to make a swift and accurate diagnosis. Computed tomography (CT) scans are very helpful. A critical decision in these cases is whether to attempt to eradicate the infection without removing the pancreas allograft. Incomplete eradication of the infection will result in progression to sepsis and multiple organ system failure. Peripancreatic infections can result in the development of a mycotic aneurysm at the arterial anastomosis that could cause arterial rupture. Transplantation pancreatectomy is indicated if mycotic aneurysm is diagnosed. The incidence rate of intra-abdominal abscess has been reduced greatly with better recognition of the criteria for suitable cadaveric pancreas grafts for transplantation. Improved perioperative antibiosis, including antifungal agents, has contributed to the decreased incidence of intra-abdominal infection, as well. Perhaps the most significant contribution to reducing the incidence of intra-abdominal abscess has been the efficacy of immunosuppressive agents in reducing the incidence of acute rejection, thereby minimizing the need for intensive antirejection immunotherapy. Gastrointestinal (GI) bleeding occurs in the enteric-drained pancreas from a combination of perioperative anticoagulation and bleeding from the suture line of the duodenoenteric anastomosis. This is self-limited and will manifest as a diminished hemoglobin level along with heme-positive or melanotic stool. Conservative management will often suffice; reoperative exploration is rarely needed. Bladder-drained pancreas transplantation is a safer procedure than enteric-drained pancreas transplantation with respect to the possibility of intra-abdominal abscess. However, it is hampered by numerous, albeit less morbid, complications. Urine and pancreatic exocrine leakage from breakdown of the duodenal segment can occur and is usually encountered within the first 2-3 months following transplantation (although it can occur years following transplantation). This is the most serious postoperative complication of the bladder-drained pancreas. Operative exploration and repair is usually required. The degree of leakage can be determined best intraoperatively, and proper judgment can be made whether direct repair is possible or more aggressive surgery, involving enteric diversion or graft pancreatectomy, is indicated. Pancreas transplantation results in the excretion of approximately 500 mL of bicarbonate-rich fluid with pancreatic enzymes into the bladder each day. The resulting change in the bladder urine pH accounts, in part, for an increase in urinary tract infections. In some cases, a foreign body, such as an exposed suture from the duodenocystostomy, acts as a nidus for urinary tract infections or stone formation. Acute postoperative hematuria in patients with a bladder-drained pancreas transplant usually is due to ischemia/reperfusion injury to the duodenal mucosa or to a bleeding vessel on the suture line that is aggravated by the antiplatelet or anticoagulation protocols often initiated to minimize vascular thrombosis. These cases are self-limited but may require a change in bladder irrigations and, if severe, cystoscopy, to evacuate the clots. Occasionally, a formal open cystotomy and suture ligation of the bleeding vessel is necessary intraoperatively. If relatively late chronic hematuria occurs, transcystoscopic or formal operative techniques may be necessary. Sterile cystitis, urethritis, and balanitis may occur after bladder-drained pancreas transplantation. This is due to the effect of the pancreatic enzymes on the urinary tract mucosa and is experienced more commonly in male recipients. Urethritis can progress to urethral perforation and perineal pain. Conservative treatment with Foley catheterization and operative enteric conversion represent the extremes of the continuum of treatment. Metabolic acidosis routinely develops as a consequence of bladder excretion of large quantities of alkaline pancreatic secretions. Patients must receive oral bicarbonate supplements to minimize the degree of acidosis. Because of the relatively large volume losses, patients also are at risk of episodes of dehydration exacerbated by significant orthostatic hypotension. Reflux pancreatitis can result in acute inflammation of the pancreas graft, mimicking acute rejection. It is associated with pain and hyperamylasemia and is believed to be secondary to reflux of urine through the ampulla and into the pancreatic ducts. Often, bacteria are found in the urine. This frequently occurs in a patient with neurogenic bladder dysfunction. This complication is managed with Foley catheterization. Reflux pancreatitis will resolve quickly. The patient may require a complete workup of the cause of bladder dysfunction, including a pressure-flow study and voiding cystourethrogram. Interestingly, in older male patients, even mild hypertrophy of the prostate has been described as a cause of reflux pancreatitis. If recurrent graft pancreatitis occurs, enteric conversion may be indicated. Wiseman AC. The role of kidney-pancreas transplantation in diabetic kidney disease. Curr Diab Rep. 2010 Oct. 10(5):385-91. [Medline]. [Full Text]. Kandaswamy R, Stock PG, Gustafson SK, Skeans MA, Curry MA, Prentice MA, et al. OPTN/SRTR 2015 Annual Data Report: Pancreas. Am J Transplant. 2017 Jan. 17 Suppl 1:117-173. [Medline]. Centers for Disease Control and Prevention. National Diabetes Statistics Report, 2017. Atlanta, GA: U.S. Department of Health and Human Services; 2017. [Full Text]. Dholakia S, Mittal S, Quiroga I, Gilbert J, Sharples EJ, Ploeg RJ, et al. Pancreas Transplantation: Past, Present, Future. Am J Med. 2016 Jul. 129 (7):667-73. [Medline]. Kandaswamy R, Stock PG, Gustafson SK, Skeans MA, Curry MA, Prentice MA, et al. OPTN/SRTR 2016 Annual Data Report: Pancreas. Am J Transplant. 2018 Jan. 18 Suppl 1:114-171. [Medline]. [Full Text]. Stratta RJ, Taylor RJ, Ozaki CF, Bynon JS, Langnas AN, Shaw BW Jr. Combined pancreas-kidney transplantation versus kidney transplantation alone: analysis of benefit and risk. Transplant Proc. 1993 Feb. 25(1 Pt 2):1298-301. [Medline]. Schulak JA, Mayes JT, Hricik DE. Kidney transplantation in diabetic patients undergoing combined kidney-pancreas or kidney-only transplantation. Transplantation. 1992 Mar. 53(3):685-7. [Medline]. Morath C, Zeier M, Döhler B, Schmidt J, Nawroth PP, Opelz G. Metabolic control improves long-term renal allograft and patient survival in type 1 diabetes. J Am Soc Nephrol. 2008 Aug. 19(8):1557-63. [Medline]. Tyden G, Bolinder J, Solders G, Brattstrom C, Tibell A, Groth CG. Improved survival in patients with insulin-dependent diabetes mellitus and end-stage diabetic nephropathy 10 years after combined pancreas and kidney transplantation. Transplantation. 1999 Mar 15. 67(5):645-8. [Medline]. Gruessner RW, Gruessner AC. Pancreas After Islet Transplantation: A First Report of the International Pancreas Transplant Registry. Am J Transplant. 2016 Feb. 16 (2):688-93. [Medline]. [Full Text]. Redfield RR, Rickels MR, Naji A, Odorico JS. Pancreas Transplantation in the Modern Era. Gastroenterol Clin North Am. 2016 Mar. 45 (1):145-66. [Medline]. United Network for Organ Sharing. Data. UNOS. Available at https://unos.org/data/. January 31, 2018; Accessed: March 7, 2018. Becker BN, Odorico JS, Becker YT, Groshek M, Werwinski C, Pirsch JD, et al. Simultaneous pancreas-kidney and pancreas transplantation. J Am Soc Nephrol. 2001 Nov. 12(11):2517-27. [Medline]. [Full Text]. Pavlakis M, Khwaja K. Transplantation for type 1 diabetes: whole organ pancreas and islet cells. Curr Diab Rep. 2006 Dec. 6 (6):473-8. [Medline]. Freise CE, Narumi S, Stock PG, Melzer JS. Simultaneous pancreas-kidney transplantation: an overview of indications, complications, and outcomes. West J Med. 1999 Jan. 170(1):11-8. [Medline]. Scalea JR, Redfield RR 3rd, Arpali E, Leverson G, Sollinger HW, Kaufman DB, et al. Pancreas transplantation in older patients is safe, but patient selection is paramount. Transpl Int. 2016 Jul. 29 (7):810-8. [Medline]. [Full Text]. Wang Q, Klein R, Moss SE, Klein BE, Hoyer C, Burke K. The influence of combined kidney-pancreas transplantation on the progression of diabetic retinopathy. A case series. Ophthalmology. 1994 Jun. 101(6):1071-6. [Medline]. Koznarova R, Saudek F, Sosna T, Adamec M, Jedinakova T, Boucek P. Beneficial effect of pancreas and kidney transplantation on advanced diabetic retinopathy. Cell Transplant. 2000 Nov-Dec. 9(6):903-8. [Medline]. Mittal S, Johnson P, Friend P. Pancreas transplantation: solid organ and islet. Cold Spring Harb Perspect Med. 2014 Apr 1. 4 (4):a015610. [Medline]. Lefrancois N, Petruzzo P, Sepeteanu I, Da Silva M, McGregor B, Dawahra M. Impact of the functioning pancreas on long-term renal function in pancreas-kidney transplantation. Transplant Proc. 2001 Feb-Mar. 33(1-2):1690-1. [Medline]. Dean PG, Kukla A, Stegall MD, Kudva YC. Pancreas transplantation. BMJ. 2017 Apr 3. 357:j1321. [Medline]. Hathaway DK, Abell T, Cardoso S, Hartwig MS, el Gebely S, Gaber AO. Improvement in autonomic and gastric function following pancreas-kidney versus kidney-alone transplantation and the correlation with quality of life. Transplantation. 1994 Mar 27. 57(6):816-22. [Medline]. Kennedy WR, Navarro X, Goetz FC, Sutherland DE, Najarian JS. Effects of pancreatic transplantation on diabetic neuropathy. N Engl J Med. 1990 Apr 12. 322(15):1031-7. [Medline]. Martinenghi S, Comi G, Galardi G, Di Carlo V, Pozza G, Secchi A. Amelioration of nerve conduction velocity following simultaneous kidney/pancreas transplantation is due to the glycaemic control provided by the pancreas. Diabetologia. 1997 Sep. 40(9):1110-2. [Medline]. Navarro X, Sutherland DE, Kennedy WR. Long-term effects of pancreatic transplantation on diabetic neuropathy. Ann Neurol. 1997 Nov. 42(5):727-36. [Medline]. Solders G, Tydén G, Persson A, Groth CG. Improvement in diabetic neuropathy 4 years after successful pancreatic and renal transplantation. Diabetologia. 1991 Aug. 34 Suppl 1:S125-7. [Medline]. Cashion AK, Hathaway DK, Milstead EJ, Reed L, Gaber AO. Changes in patterns of 24-hr heart rate variability after kidney and kidney-pancreas transplant. Transplantation. 1999 Dec 27. 68(12):1846-50. [Medline]. Fiorina P, La Rocca E, Venturini M, Minicucci F, Fermo I, Paroni R. Effects of kidney-pancreas transplantation on atherosclerotic risk factors and endothelial function in patients with uremia and type 1 diabetes. Diabetes. 2001 Mar. 50(3):496-501. [Medline]. Fiorina P, La Rocca E, Astorri E, Lucignani G, Rossetti C, Fazio F, et al. Reversal of left ventricular diastolic dysfunction after kidney-pancreas transplantation in type 1 diabetic uremic patients. Diabetes Care. 2000 Dec. 23 (12):1804-10. [Medline]. [Full Text]. Gaber AO, el-Gebely S, Sugathan P, Elmer DS, Hathaway DK, McCully RB. Early improvement in cardiac function occurs for pancreas-kidney but not diabetic kidney-alone transplant recipients. Transplantation. 1995 Apr 27. 59(8):1105-12. [Medline]. La Rocca E, Fiorina P, Astorri E, Rossetti C, Lucignani G, Fazio F, et al. Patient survival and cardiovascular events after kidney-pancreas transplantation: comparison with kidney transplantation alone in uremic IDDM patients. Cell Transplant. 2000 Nov-Dec. 9 (6):929-32. [Medline]. Schweitzer EJ, Anderson L, Kuo PC, Johnson LB, Klassen DK, Hoehn-Saric E. Safe pancreas transplantation in patients with coronary artery disease. Transplantation. 1997 May 15. 63(9):1294-9. [Medline]. Pancreas Transplantation Committee. Proposal for the Definition of Pancreas Graft Failure. Organ Procurement and Transplantation Network. Available at https://optn.transplant.hrsa.gov/governance/public-comment/proposal-for-the-definition-of-pancreas-graft-failure/. Accessed: April 26, 2018. Niclauss N, Bédat B, Morel P, Andres A, Toso C, Berney T. Impact of graft implantation order on graft survival in simultaneous pancreas-kidney transplantation. Transpl Int. 2016 May. 29 (5):627-35. [Medline]. [Full Text]. Bamoulid J, Staeck O, Halleck F, Dürr M, Paliege A, Lachmann N, et al. Advances in pharmacotherapy to treat kidney transplant rejection. Expert Opin Pharmacother. 2015. 16 (11):1627-48. [Medline]. Jordan SC, Reinsmoen N, Peng A, Lai CH, Cao K, Villicana R, et al. Advances in diagnosing and managing antibody-mediated rejection. Pediatr Nephrol. 2010 Oct. 25 (10):2035-45; quiz 2045-8. [Medline]. Knight RJ, Lawless A, Patel SJ, et al. Simultaneous kidney-pancreas transplantation for end-stage renal disease patients with insulin-dependent diabetes and detectable C-peptide. Transplant Proc. 2010 Dec. 42(10):4195-6. [Medline]. Writing Team for the Diabetes Control and Complications Trial/Epidemiology of Diabetes Interventions and Complications Research Group. Effect of intensive therapy on the microvascular complications of type 1 diabetes mellitus. JAMA. 2002 May 15. 287 (19):2563-9. [Medline]. Disclosure: Author for: UpToDate, ACP Smart Medicine, Elsevier, McGraw-Hill, Wolters Kluwer.